6½ digit (2,200,000 count) dual-display digital multimeter suits high-precision, multifunction, and automatic measurements. Fairport, NY, USA: Saelig Company, Inc. (www.saelig.com) has introduced the Siglent SDM3065X - an economical 6½ digit dual-display digital multimeter that is suited to high-precision, multifunction, and automation measurement applications. It combines basic high-accuracy measurement functions, with multiple math and display choices, and special features including histogram, trend chart, bar chart, statistics, hold measurement, dBm, etc. 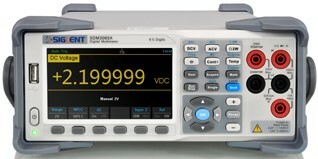 Reading at up to 300 samples/second, the Siglent SDM3065X DMM takes measurements of true-RMS AC voltage and AC current, resistance to 100Mohms, capacitance to 10,000 microfarads, continuity and diode tests, frequency and period measurements, and temperature, with support for thermocouple and RTD sensors. It contains 1GB of Flash memory for storage of configuration and data files, and also supports USB external storage. Siglent's EasySDM software, provided free, allows for easy PC connectivity, external control and display. Housed in an attractive compact (11.6" × 10.3" × 4.3") prop-stand case, the SDM3065X weighs only 7.5lbs. The Siglent SDM3065X's combination of comprehensive features, ease of use and versatile functionality make this multimeter a perfect general purpose, high-accuracy measuring tool. Applications include research and development, education, circuit testing and debug, automated production testing, etc. TheSDM3065X is available now at US$729.00 from Saelig Company Inc.
For detailed specifications, free technical assistance, or additional information, please contact Saelig at 1-888-7SAELIG, via email: info@saelig.com, or visit www.saelig.com.